I was provided a copy of this graphic novel by the publisher in exchange for an honest review.I had never heard of the 47 Ronin before, and the release of the graphic novel is timely with the movie releasing theaters now starring Keanu Reeves. The beginning sucked. I couldn't tell who was who and had to keep going back and rereading parts and trying to figure the story out. It seriously needed a prologue for people like me who didn't know the story and couldn't keep track of the similarly named and looking characters. And it's as especially that the characters were drawn similarly that added to my overall confusion. The language was also unclear. Then about halfway through the ruse and what they're (the samurai) are trying to do starts to make sense. It gets interesting partway through and I definitely felt hooked to continue. I loved the ending; it was beautiful. The artwork was spot on, and it's definitely a great story. Overall there's a lot of room for improvement. I liked the graphic novel portrayal but wish it would've had a prologue. If more was explained early on, it would've caused less confusion because I had to keep flipping back pages and rereading and trying to see what characters were who and what side. Relata muy bien lo hechos ded la historia de los 47 ronin, lo que en occidente diríamos fue su venganza, pero para los japoneses es una por demás admirable muestra de apego y lealtad la espíritu del Bushido. El arte y las gráficas son un poco básicas y más que relatar la histia, sirven para ilustrarla; pero cumple admirablemente su cometido de contar una historia lineal fluida y con buen sentido del ritmo literario.Una característica adicional que la hace más atractiva: la mayoría de los gringos ni la entienden ni les gusta, a lo mejor se esperaban una aventurita de gritos y sombrerazos como "300" y no les cabe en la cabeza que haya perspectivas diferentes. Es interesante, muy buena para conocer los hechos d una forma clara y directa. This is a successful attempt to accurately depict a legendary historical event. Someone as fascinated by Japanese culture as I am will love this graphic novel for that fact, but anyone expecting it to be similar to the upcoming movie where Keanu Reeves literally sword fights with dragons will be seriously disappointed. The beautiful artwork and sparse text made it a fast read and gave the revenge tale an ethereal feel, and while I would have liked to see the revenge plot fleshed out in greater detail, I appreciate that may not have been possible given how closely this story seems to be taken from historical record.Full disclosure: I received a copy of this book from NetGalley in exchange for a review. Decent art, but overall a very slow story. The history itself is interesting, but for a graphic novel this did a lot more telling than showing. The end result is rather dry and hardly as exciting I'd hoped. I received a free copy of this title from NetGalley and the publisher in exchange for my honest review.I admit that when I began this story, the tale of the 47 ronin wasn't exactly fresh in my mind. I kept thinking about the film Seven Samurai which ALSO features ronin, and I kept wondering where the put-upon villagers were, etc. Gosh, I am out of it.I really enjoyed the way that the setup for the revenge was done: it was very clear that what Kiro was doing was very offensive to the feudal lords. I also liked their discussions on how to deal with his jerkiness and that they went and painted to clear their heads. That whole chapter in the saga was really well done. However, after the lord who attempts to assassinate Kiro commits seppuku, the story lost a LOT of text and became difficult to follow. I'm not sure if this is because this is supposed to be a very well-known story ... ? The panels became very jumpy and it was difficult to distinguish who was on which side, particularly during the final battle scene (hint: the 47 ronin are wearing helmets). But then there are arrows flying everywhere--who got shot? What is going on here?--and random people dying and it's all very chaotic. Perhaps that's the intent--to have the art mirror the chaos of battle--but this is a little much. Also (and I don't really consider this a spoiler, as it's in the original history), but when the ronin finally exact their revenge ... the artwork, to me, looked like the illustrator started to draw the act of seppuku, cutting across the belly, and then switched to having Kiro's head cut off instead. It seemed like a very ... wide cut to decapitate someone. Not that I am a connoisseur of such things ... but.I know I received an ARC, and I see that the title is in color--I wonder if the panels had been colored, perhaps things would have been more clear.It's certainly not a bad retelling of the story (in fact, I really liked the beginning), but things got very muddled in the middle and kind of limped to a halt at the end. Starting up my reviewing for Library Journal again. This is the story of feudal lord Asano in 18th century Japan who's insulted by another lord, Kira, and is ordered to commit ritual suicide after attempting to kill Kira in the shogun's residence. Asano's samurai, rendered masterless ronin, take revenge for their master's death, and are consequently also ordered to kill themselves honorably.It sounds like this is an extremely famous story in Japan, consisting of historical fact that has been embellished as legend over time. I'm going to Japan next March, so I hope maybe I can visit Sengakuji where Asano and the 47 ronin are buried.The Japanese culture of honor earlier in their history continues to blow my mind. One guy insulted another, which resulted in the deaths of dozens of people. Wow. Reading more about the context, though, I can understand the ronins' actions a little better. Although Asano is pretty thoughtless for attacking Kira while knowing what it would mean for his entire family and followers, it sounds unusual that Kira wasn't punished for his role in driving Asano to attack him. Flipping back through the book, I see that the author made it pretty clear that the ronin were outraged by this.It bugged me that the author misspelled "sake" as "saki," although it's a minor error and represents a common mispronunciation in English speakers. Overall, I disagree with other reviewers who didn't like the pacing of the book--I felt that the author provided the right scenes to tell the story, and that more would have been too much. Since I didn't know the story before reading this version, I was confused about what was happening in the beginning, though, and I thought that Shimojima drew Kamei and Asano's faces too similarly. I had to look at some of the pages in the first chapter three or four times to understand which of them was whom when I couldn't see much of their clothing. Many thanks to Shambhala Publications, Inc. for approving my request for this title on NetGalley. It was a bit difficult to rate The 47 Ronin, I have to say, because while I did like the artwork, which felt quite fresh and original, I had trouble distinguishing between the different characters most of the time, and that certainly affected my rating. As to what could have been done to avoid this issue, though, I can honestly say that I don't know. It is difficult, especially when they are dressed in very similar outfits, and there's also the fact that to us Westerners Japanese could look quite similar to each other, AND there's also the fact that as it is historically accurate they couldn't very well give someone the distinction of blond hair, or any other hair style but the top knot, really, but I feel that maybe the faces could have been developed more and being made more distinctive.On the plus side, apparently this version of the story of the 47 ronin is among the most accurate retellings, and it did indeed have a very authentic look and feel to it. Even if so far it may sound like I didn't like it very much, I must say that I did enjoy it a lot, apart from the problem with distinguishing the characters. Another thing which prevented me from giving more starts was that I felt it could have been developed just that little bit more - I know it's only a graphic novel, but it still felt somewhat bare-boned. That could have been just an extremely personal perception, though, as I'm used to manga who can afford to spend quite some time on detail due to the amount of volumes they get. I would definitely recommend this graphic novel to anyone who wants to get acquainted with an enjoyable yet accurate adaptation of the legendary story. The 47 Ronin adapts a classic Japanese story of Bushido, the Samurai code of honor. This particular adaptation is in graphic novel form, having been written by Sean Michael Wilson and Akiko Shimojima handling the art duties. It follows the tale of a group of samurai, disgraced and left leaderless after their lord had assaulted a court official in Edo castle and committed seppuku. The samurai, believing that their lord had borne great offense from this official, set out on a plan for revenge.The art and writing are both spare, perhaps too much so. It seems less like a smoothly-flowing story and more of a series of standalone panels. It doesn't flow, to my eye. The emotion shifts from one panel to the next are jarring. On one hand it will feel like true Japanese writing, but then the next panel will feel like a somewhat rough translation. I'll actually be quite curious to see the movie version that Keanu Reeves is starring in (I know, I know) this winter. It's due out around Christmas, and other than Keanu, has a solid cast of Japanese actors, including Rinko Kikuchi of Pacific Rim, Hiroyuki Sanada (The Last Samurai), and Cary-Hiroyuki Tagawa (Mortal Kombat, Pearl Harbor, many others). I mean, it's hard to beat the look of samurai on the big screen, and an adaptation with a bit more energy could be epic. I saw previews for the movie before I heard of the book. I enjoy watching films like "The Last Samurai," or reading books with samurai in them like Ghost in the Tokaido Inn. For modern Americans, it may be hard to imagine that all the samurai loyal to a lord who has been disgraced would also share that dishonor, or that the shogun would disband the domain rather than appointing someone else to rule it. The strict adherence to their code of honor set the samurai apart from other professions, even other warriors. The story of Lord Asano's death and the revenge planned by his samurai has survived since the actual events in 18th century Japan.There are many wordless panels where the action in the illustrations is all that is needed to tell the story. The black and white graphics prevent the violence from being overly gory in presentation, although the severed heads are quite dramatic. I would recommend this for ages 12 and up due to the violence and a word that most elementary school families would consider inappropriate.I read an e-book provided by the publisher through NetGalley. Overall this is a good introduction to the story of the 47 Ronin and I will be buying it for my library. I have no doubt that Americans who've never heard of this event in Japanese history will find it interesting. The art is particularly well done and I found the story compelling. My teens will probably really enjoy it.Yet in my opinion there is something about this that just doesn't quite hit. It doesn't really explain the Bushido codes or why the actions of the Ronin are seen as honorable and not just petty vengeance. It seems to be missing cultural context or some kind of spark that would make the characters more than just 1 dimensional figures. I didn't feel like I got to know any of the characters as people and I would ultimately have liked to see the ending fleshed out more with more about the shogun's deliberations leading to their deaths not just a 'btw the shogun kinda respected them but thats the way the cookie crumbles'.Like I said, I think it will be an interesting read for those who want a basic introduction to the Ronin but it's ultimately unexceptional. In feudal Japan there is a famous story of 47 ronin who avenge their master. There is a recent Keanu Reeves movie that tells the story, but adds supernatural elements. This graphic novel tells the story without these sort of elements and it's a pretty compelling story on it's own.A cruel shogun pushes a young lord Asano to the point where Asano attempts to kill the shogun. The shogun demands the young man's death. This shocks and outrages Asano's samurai, but rather than take immediate revenge, they enact a subtle plan that will take years to fulfill. There is a reason that this is a famous story in Japan, and it's one that I wasn't familiar with. The art by Akiko Shimojima is black and white and very good. At times, it's a bit hard to follow the action. For Western readers, there could have been an introduction or appendix to explain some of the things happening in the story, but overall, it's a great story.I was given a review copy of this graphic novel by Shambhala Publications, Inc. and Netgalley in exchange for an honest review. Thank you for letting me review this graphic novel. I received a free copy through NetGalley. "The 47 Ronin" is a graphic novel adaptation of one of Japan's oldest and most famous stories in samurai history. When their master, Asano, is dishonored and forced to commit seppuku, 47 now master-less ronin plot together to avenge their daimyo.The graphic novel starts out prior to the confrontation between Asano and Kira, the court member who dishonored him. It took a little bit to get into not being as familiar with the story as there isn't a lot of background info on the time period or culture presented. Also, it was difficult to discern at times who was who. However, once Asano commits seppuku, the story picks up.Overall, the story is definitely interesting and made me want to search out more historical information (there is even an upcoming movie with Keanu Reeves). But the adaptation is hampered a bit by some pacing issues and a lack of contextual information. Perhaps someone with a better understanding of the event may appreciate the work more. 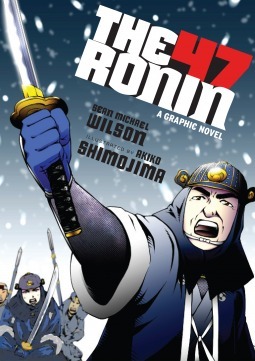 This graphic novel depicts a historically accurate version of the tale of the 47 Ronin. Set in feudal Japan, the story is an actual incident in that country's history, where a group of now-leaderless samurai patiently plot revenge on the noble responsible for their master's death, against the directive of the ruling shogunate. A glimpse into the unique culture of this storied country and the Bushido code, the code by which all samurai follow, The 47 Ronin brings this national tale to an international audience. Pilgrims from all over the world journey to the grave site of ronin every year in December to pay their respects to these brave men who paid the ultimate price for pursuing justice for their fallen master. This is a great dramatization of a true Japanese legend, of 47 samurai who plot for two years to avenge the death of their lord, and then committing ritual suicide afterwards. The artwork is in the manga style and the story, although a bit slow to start, accelerates forward to the exciting conclusion. The only problem a reader might have is keeping track of all the Japanese characters! This graphic novel will appeal to history buffs and those who love adventure and superhero-type graphic novels.Reviewed by Mr. Gadd. I found this graphic novel confusing. I found the offense of the initial incident some what muddled, perhaps it is because I am outsider to bushido and do not grasp the entirety of the disrespect. I had read another version of this done by Mike Richardson and Stan Sakai which provided a fuller explanation of how Kira Yoshinaka goaded daimyo Asano Naganori into attacking himself, yet the full offense escapes me in both versions. Perhaps others find more in the story than I do or I just was not moved by the catalyst for this tale. I like the artwork much better in this one compared to the Richardson/Sakai version. This one had less background details and I think it would have been harder to follow if I hadn't read the Richardson/Sakai version first, especially regarding Kira's corruption and insult to Asano. Overall though, I liked this version better. 47 Ronin was an interesting graphic novel depicting the true story of 47 men who sought avenge their master and his honor. The novel was a very quick read and the artwork was great. It was amazing to see how the ronin in this true story came to life within the pages and to be able to experience the trials they faced. Overall, it was a fairly decent novel. The story of The 47 Ronin is beautiful, however I did not enjoy this graphic novel much. There was not enough character development and sometimes I felt like I was missing something, because some parts were very confusing and not very well explained. I liked the art but I found it quite troublesome to tell the characters apart. The 47 Ronin is a famous story from the history of feudal Japan. A corrupt official causes offense which destroys a family. The leaderless samurai must work in secret waiting for their revenge. This 47 Ronin graphic novel is a faithful adaptation of the narrative. Amusingly it seems to have a greater focus on the initial offense then it does to the climax. Another for my collection of historical graphic novels--this is good at using visuals to enhance the political and ethical debate within bushido about the obligations of the 47 Ronin, but the brevity of the work doesn't allow for any larger context and the epilogue is pat and unreflective. Keanu Reeve's 47 Ronin brought me to Wilson's graphic novel because I felt that the 2013 flick was so bad, I needed manga to bring me some calm back into my life. Wilson's graphic novel is way better than the Reeve's movie because there's actual blood. What a relief! The story of the 47 Ronin is a trully beautiful story. This doesn't do it justice. You can't even tell the characters apart. I mean, I didn't expect them to have pink and purple hair to stand out but I think that the illustrator could have done a better job with this. It's okay, a quick little read. I'd love to see this art used to depict a longer and fuller account of the story, but this book is fine for what it is. Sean Michael Wilson Akiko Shimojima - Sean Michael Wilson is a comic book writer from Scotland. He has had around 30 books published with a variety of US, UK and Japanese publishers, including: a comic book version of A Christmas Carol ('Best of 2008’, Sunday Times), AX:alternative manga ( 'Best ten books of 2010’, Publishers Weekly), Parecomic (with an introduction by Noam Chomsky, his first contribution to a book in graphic form). He is currently writing books for big Japanese publisher Kodansha, being the only British writer to do so. In fact, he is the only pro manga writer from Britain who lives in Japan. He is also the editor of the critically acclaimed collection 'AX:alternative manga' (Publishers Weekly's 'Best ten books of 2010' and nominated for a Harvey award). Working with various Japanese artists he has written a unique line of Japanese history/martial arts/Samurai books, including The Book of Five Rings, Secrets of the Ninja, The 47 Ronin, and Cold Mountain (winner of China Comic and Animation Competition 2015 ‘Best Overseas Comic’ award). In 2016 his book 'The Faceless Ghost' was nominated for the prestigious Eisner Book Awards, and received a medal in the 2016 'Independent Publisher Book Awards'. In 2017, his book Secrets of the Ninja won an International Manga Award from the Japanese government - he is the first British person to receive this award. His main influences remain British and American creators - such as Alan Moore, Grant Morrison, Eddie Campbell and Harvey Pekar. He often gives lectures and talks about comics in schools and colleges, and writes articles for such places as The Japan Times, The London Economic and The Herald Scotland.